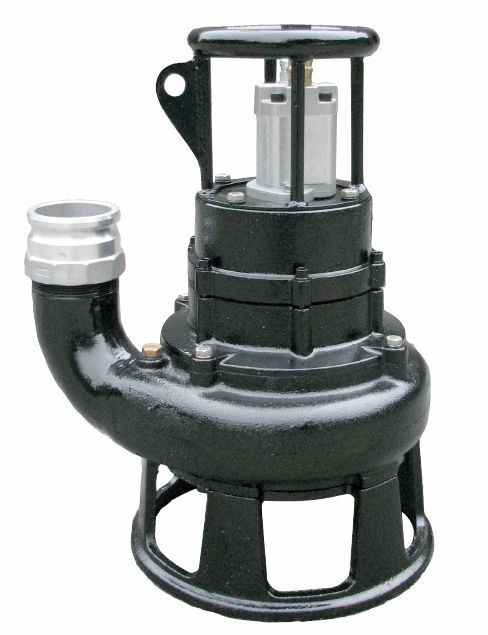 The S4SHR-LP pump is a narrow version of the S4SHR pump. It’s capable of fitting through most manholes, as it is only 21.5-in wide. This model is designed to continuously shear and rip solids with a 360-degree shredding process. It’s great for agricultural, industrial, municipal, and institutional waste applications. Its discharge size is 4-in and its maximum flow is 3,000-LPM or 810-GPM. The pump can handle solids of 3 ½-in and has a hydraulic input of 57-LPM. Its hydraulic pressure is 177-bar. The design includes a maximum head of 125-ft, weight of 225-lbs, and an open-vane shredder impeller with a tungsten carbide cutting tip. The seals are oil lubricated and the macerator suction plate is hardened. Hydraulic drives feature variable speeds and can be used safely where electrical power is impractical or hazardous. Versions are available for fixed installations and portability.